As I noted in my previous Access report, Steven Wilson will be filling you in on the fire event at Black Hill. Thanks to Steven and Jayden Andrea for compiling this report. On Wednesday the 7th of January 2015, as I was walking into my house, I saw the first lightening strike. As I got inside I saw the second and said to my wife Ann that it had hit Black Hill. 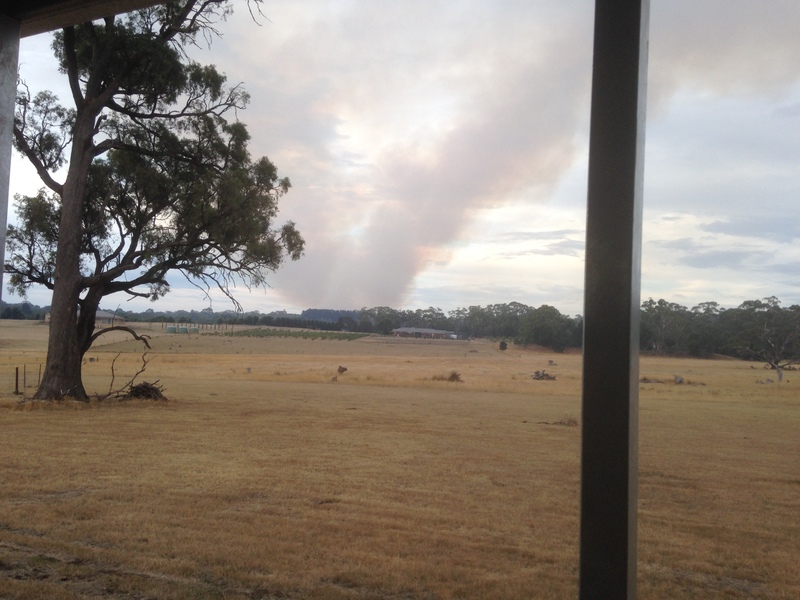 Soon after, the CFA Fire Ready app started going off: Three fires, one north of, one south of and one at Black Hill. Time to set up the fire pump and hoses. As we are 5km from Black Hill and were directly under the smoke column, it became a wait and see game. Sol Rogowski,who is a fellow climber and area neighbour and his partner Suzie Hazlam, came around to lend a hand (if needed) and watch from our deck. Around 8pm blackened leaves and bark started to land on our grass. Fortunately none of it was burning. 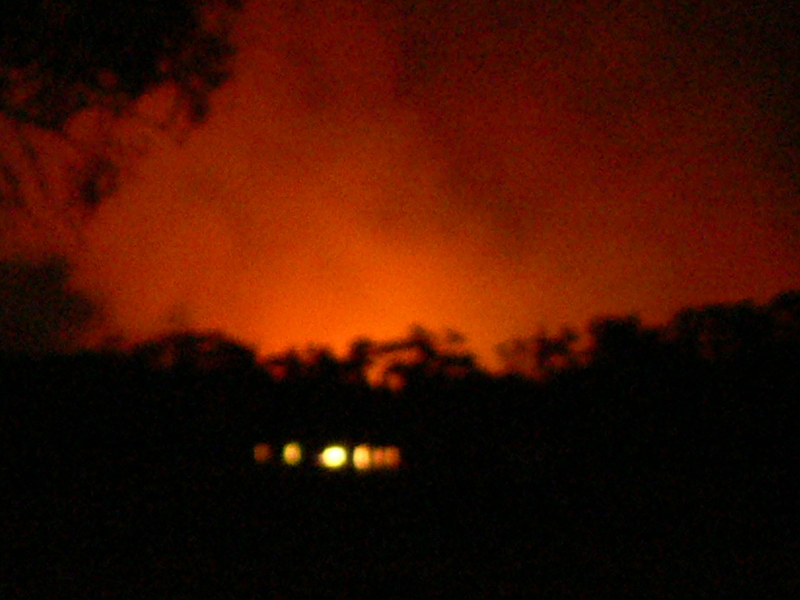 Around 10pm the South end of the park went up. 1 hour later the wind direction changed and brought some rain with it. Time to relax. 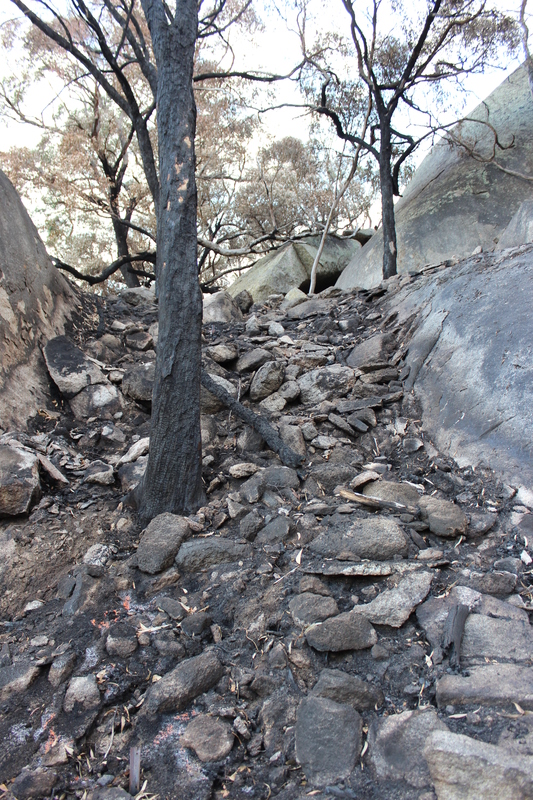 Eight days later Jayden Andrea gave me a call to let me know that he had council permission to inspect the damage to the climbing areas. We headed up that evening. 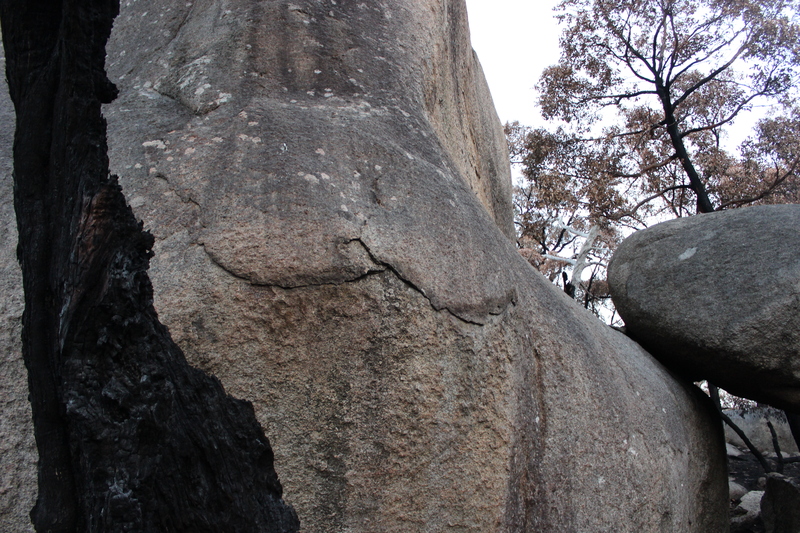 The fire has impacted all of the climbing areas. 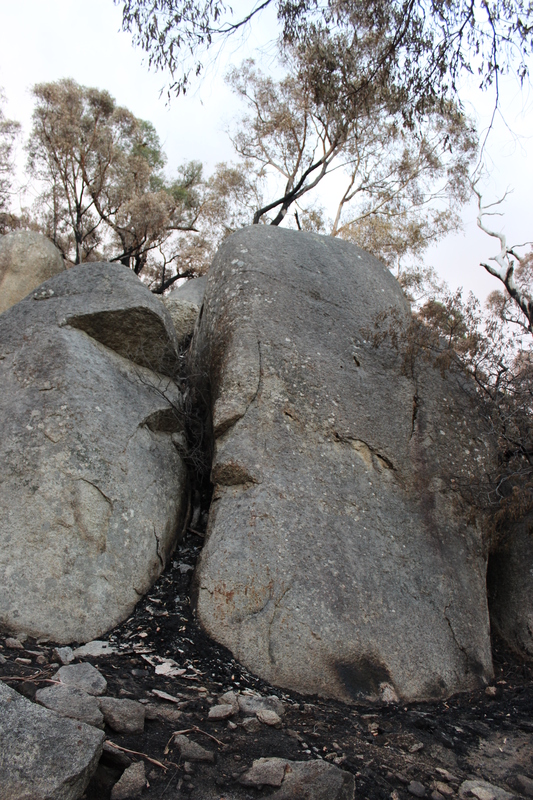 Mostly though there has been a loss of vegetation, and none of the climbs appear to have any exfoliation. A lot of the large old trees have fallen, with quite a few looking like they are also going to fall. 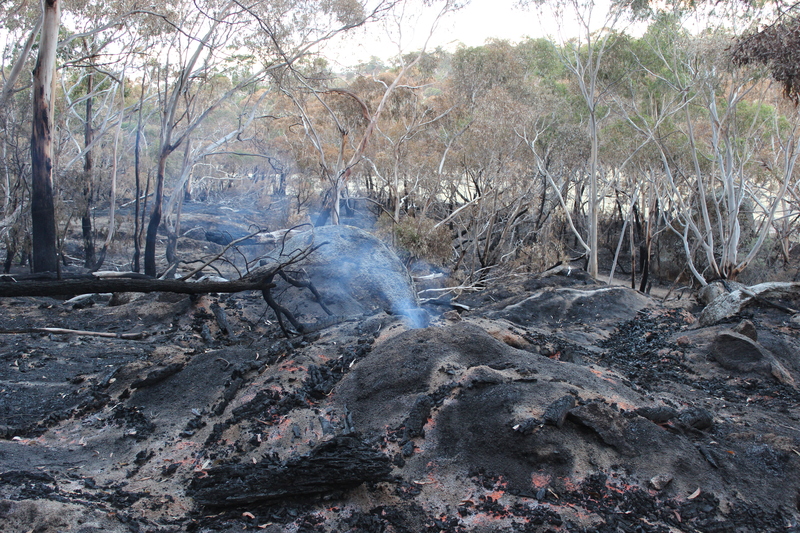 The VCC track repair work below Milawa, which took place in 2011, has been burnt out and will need redoing. The tree that you climb for the start of Pull The Ripcord has been burnt but is still standing, however you wont be able to climb it any more. An alternate start has been partially bolted and will have another bolt added when the park is open again. Alternately you can do a Batman start off the ringbolt. Bicentennial Fa(r)ce in the Dino eggs area, has lost the dead tree that use to start from. 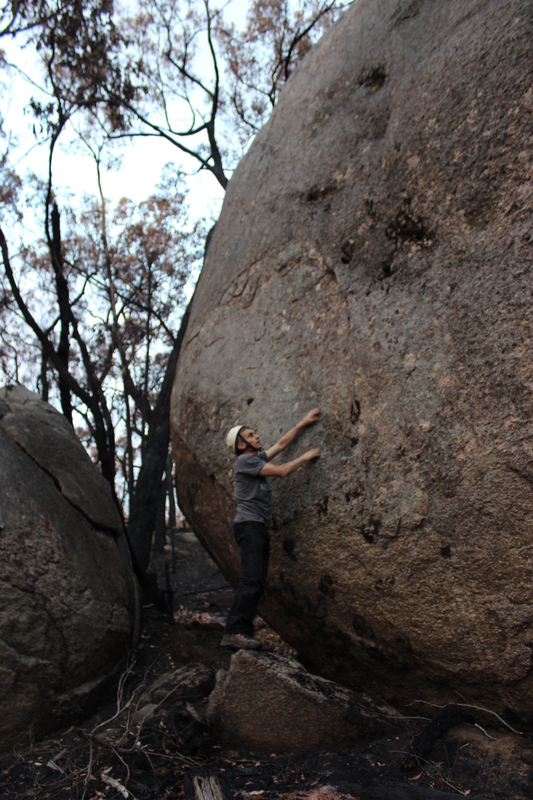 It looks like it is still climbable – although a bit harder than grade 19. Attack Of The Killer Dunny Budgies has lost its belay tree. The rear entrance car park has had a lot of damage with a number trees fallen or about to fall. Considering that Black Hill used to be a quarry, I would be concerned that erosion could prove to be an issue as there is little or no top soil for the plants to get re established in. Black Hill is currently closed. 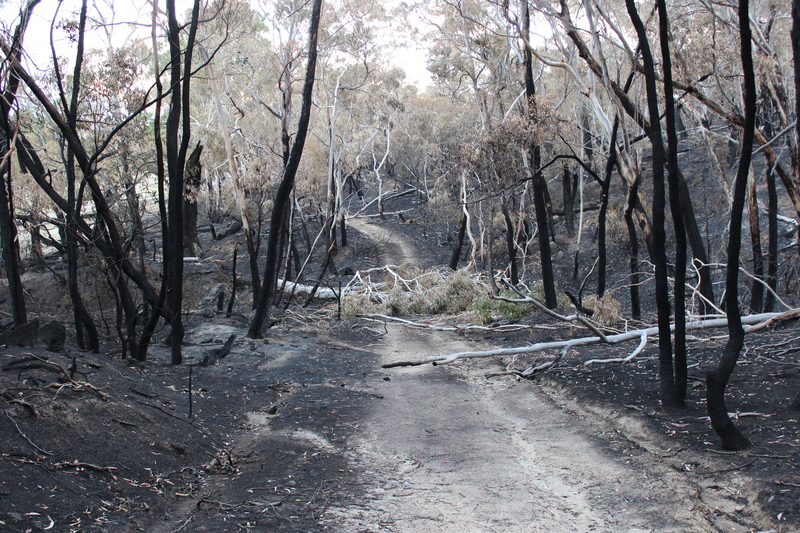 This entry was posted in black hill and tagged black hill, Bushfires, cliffcare, closures by Tracey. Bookmark the permalink.